Having sold her in November 2011, Steve Ashford at CSO Yachts tells me he's now brought the 30.69m motor yacht Bojangles back to the market. 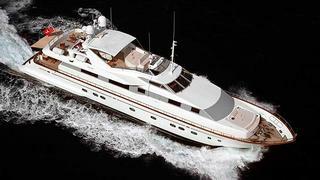 Delivered by Italy’s Falcon Yachts in 2004, Bojangles was styled by Stefano Righini and is RINA classed. Sleeping up to 11 guests in a master, VIP double and two twin cabins plus a Pullman berth, twin 2000hp MTU engines power her to a cruising speed of 22 knots with a range of 300 nautical miles. Bojangles is asking €1.98 million and Steve says owner finance is available.